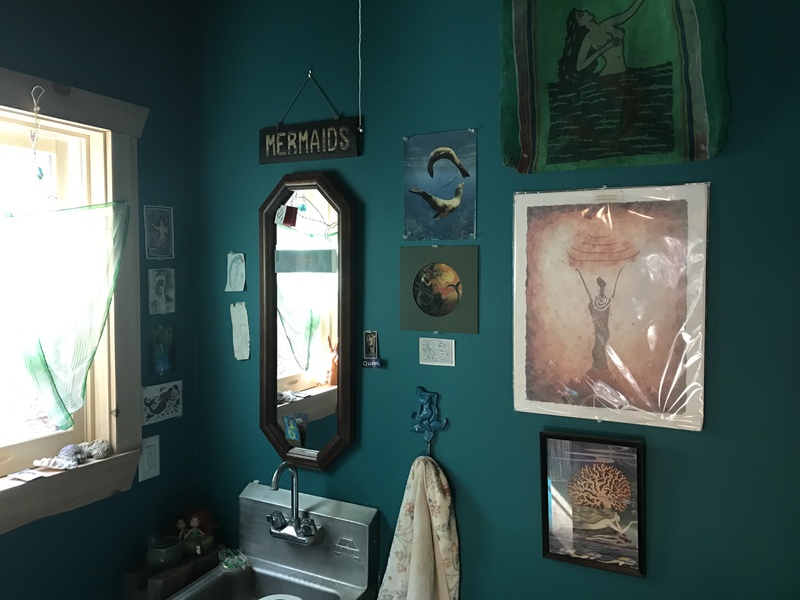 I’m writing my first blog in over a year, and even though I have a treasure trove of the most gorgeous images by Nicole McConville Photography, I’m hitting you with a photo of my studio bathroom filled with Mermaids. This is no ordinary bathroom though. This is my wealth corner. A prelude. The last time I blogged (more than a year ago), I was merrily making and selling the products in the river island apothecary body care line including all the standards: bathing salts, skin serum, creams, scrubs, etc plus my archetype anointing oils. Then I had an out-of-the-blue hysterectomy in January of 2016, leaving me menopausal at 41 years old. I had six weeks to lay on the couch and re-build my core. As my abdominal muscles were re-knitting a 7 inch vertical incision, I was re-knitting my very identity. No longer a woman with reproductive organs or hormones, who was I? I discovered I was more myself than I had ever been. I also discovered that my wealth corner was full of Mermaids. That discovery sealed the deal. I was done making the bathing salts, skin serum, creams, scrubs, etc. When your wealth corner is full of Mermaids, you do not make your living in any “standard” way. You hoist your freak flag up the flag pole, claim your divine inner (or not so inner) weirdo-o, and dive deep. If you’ve worked with The Mermaid Archetype with me, you know what I’m talking about. For me, this meant exclusive focus on the Archetype Anointing Oils. I now work strictly in the realm of ceremony, concocting and consecration. I am guided in ways I cannot explain by the plants whose oils I use. I hang out with archetypes. I make sacred space and temples on the reg. This is my core. This is the energetic expression of my still-active womb space. This is ME. There are two takeaways from this little blog post. First, follow the bread crumb trail to your true nature. For example, if your wealth corner is full of Mermaids, make meaning. Second, I am now available for said ceremonies, concocting and consecration for you and your tribe. Click HERE to find out more about becoming a river island apothecary Mother Tree and hosting your own meaningful circle. It’s good to be back, ya’ll.